Ravioles is a Cypriot specialty, similar to ravioli, probably having its roots from the Venetian times. In Cyprus this pasta dish is filled with aged halloumi, eggs and mint and they are cooked in chicken broth. This is the dish my mother would prepare during Tyrini Sunday, the last Sunday before Lent, which means cheese Sunday. On Tyrini the tradition is to cook anything with cheese, such as (tyropita), pasta, bourekia (turnovers), biscuits, etc. A savoury cheesecake I made during Christmas, based on the Greek Cretan recipe for Dakos. Boureki (plural bourekia) is a type of pastry made of a thin flaky dough known as phyllo and are filled with anari (anthotyros or myzithra, as it is known in Greece), which is similar to ricotta. Moustokouloura cookies can be made either with fresh grape juice or grape molasses. They are perfect as a snack or for breakfast! The traditional way of make the ravioles is to roll out the phyllo until thin, add a teaspoon of filling, leave a gap of about 3 – 4 cm and continue adding cheese. Then cover with the other phyllo and press the gaps with the finger to enclose the filling. Finally cut the ravioles, using a drinking glass to form them into a semicircle and boil. Alternatively, you can cut them in a ravioli press or using a ravioli cutter. At this stage you can freeze them. To cook them, do not thaw them as they will stick to each other. Just put them in the boiling water and they will defrost in the water. A few days ago my son came back from Crete and some friends from Crete, were kind enough to send me a lot of graviera cheese and fresh anthotyro cheese . So I had to think of something to do because it was a lot to store. I decided to make some ravioles with the graviera cheese and with the anthotyro I made another Cypriot recipe called “Anarotourta”. This and many more Cypriot recipes are included in my cookbook Mint, Cinnamon & Blossom Water, Flavours of Cyprus, Kopiaste as well as in Volume 1 of the e-cookbook. 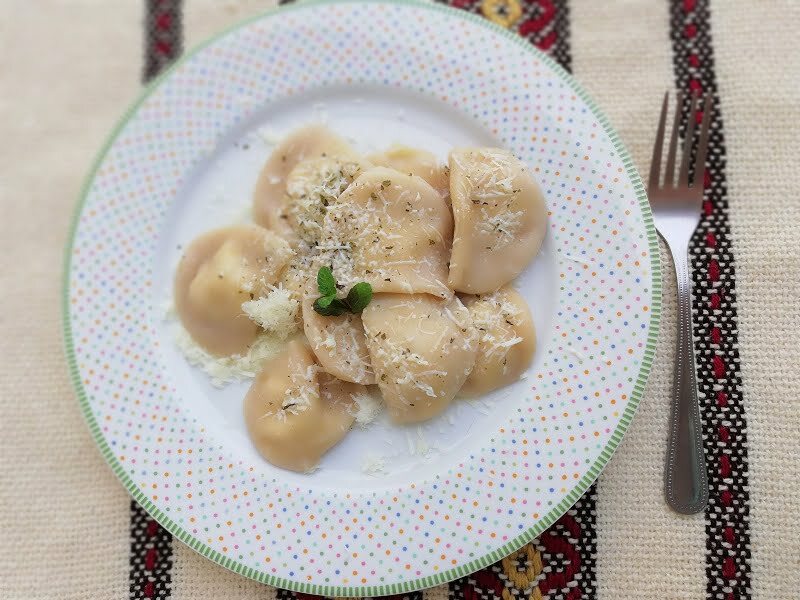 Ravioles is a Cypriot pasta specialty, similar to ravioli, which are filled with aged halloumi, eggs and mint and are cooked in chicken broth. They are served with grated halloumi on top. Boil the chicken and reserve the broth. Grate the cheese and mix in the dried mint. Add the, eggs one by one and mix until we have a nice mixture which holds together and cheese has been absorbed by the eggs. Roll out a thin phyllo either with a pasta machine or manually. Place 1 tsp of cheese mixture at the edge and leaving a gap of about 3cm (1 inch) in between continue adding cheese. Cover with remaining phyllo and press the gaps with your finger. Cut the ravioles with a drinking water glass, to give a half a semicircle shape or cut them with a ravioli cutter. Bring chicken broth or stock to a boil. If your broth contains salt, do not add any extra salt as halloumi is salty. Place ravioli in the boiling water and cook as any other pasta, for about 10 – 15 minutes stirring occasionally, as they will float. Remove with a slotted spoon into platter and sprinkle with grated halloumi mixed with dried mint. Thanks Ivy for having the pix up … I had been wanting to see them from your old blog account! Love it! Love pasta. This recipe sounds amazing!!!!!! !